Does nobody want to work for Slate? 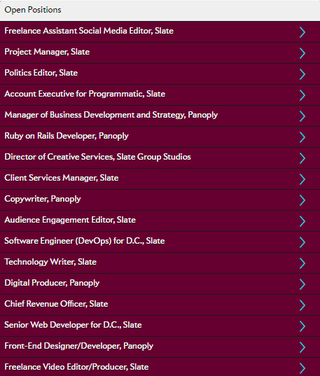 Not even a month after I wrote about Slate posting a slew of job openings the media outlet which aims to “hold Trump accountable” has today published the same long list of job openings, and added two more. Slate’s Politics Editor spot — vacated in mid-February by the firing of former Gawker Executive Editor Tommy Craggs — remains unfilled. Maybe nobody wants to work for Slate? Thoughts? Anyone know anyone who worked for them? Any idea why they fired almost everyone, only to advertise those same jobs three weeks later, and now another three weeks later, those spots remain unfilled? Is the EIC a scourge? Is the pay abysmal? Are staffers just suffering constant fainting and vomiting spells from the awful Slate page design? Were they not given free pizza on election night (which is customary in American newsrooms) and word got around and now other journalists are shunning them like the plague? Talk about journalismism — or whatever else you want — below.